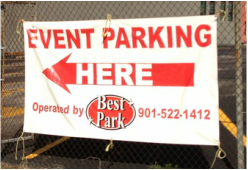 ​Best Park surface lots are located wherever you're going in downtown Memphis. They're safe, clean, convenient and affordable. To explore our lot locations check out our parking lot locations map. Best Park has Monthly Parking plans and rates for many downtown Memphis locations. We can help you find a monthly parking plan that will fit your budget. Contact Us to review our plan options at a location convenient to you. HIre a pro to run your parking operations. Take advantage of Best Park's experience and Memphis synergy to improve services and grow your bottom line. ​Contact us for a parking lot or facility evaluation. We are fully bonded, insured, and licensed. Check out our Best Park locations map for Event Parking options!